May 15, 2018 Ginger C.
Not every horse can be an all-around horse, but with the training program utilized by Dan Marcum, the ultimate goal is to produce a horse that is calm, willing, supple and able to perform well in whatever discipline he is suited for. 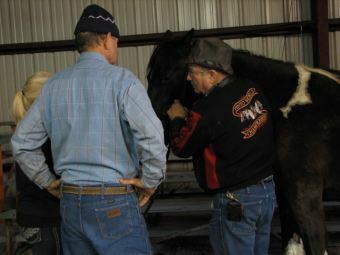 Many of the horses started with Marcum can easily walk, trot and canter with control at the end of 30 days. 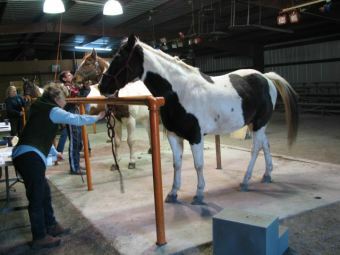 In the next month, the "Six Warm Up Exercises" are introduced Marcum has developed a series of movements that teach the horse balance and lateral work. 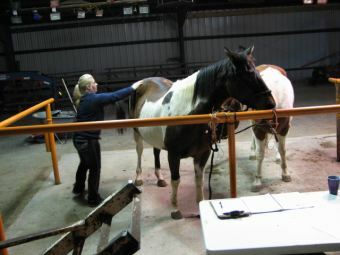 Dan’s Equine Flexion Therapy (EFT) aids in the overall wellbeing and performance of each horse. He has been very successful and appreciated by his clients ! 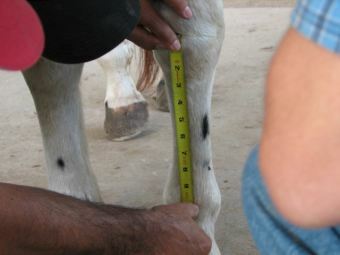 The horse should travel in a large circle with both front and back feet traveling in the same track. All angles of the steps should be the same. 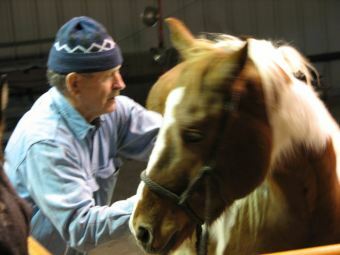 The key is to use inside pressure with a dominant outside rein and gentle rhythmic tugs to keep the head down. 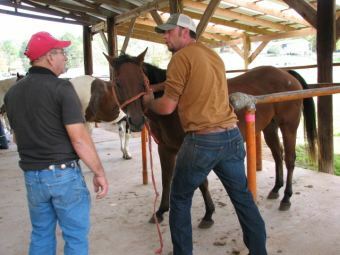 The goal is to raise the horse's back, lower his head, and turn with the outside rein. 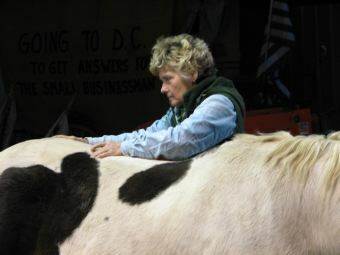 Bend the horse until the head and neck drop and the nose comes in slightly at a 30-degree angle to the circle. 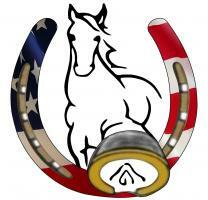 Use a soft rein, with the horses' legs staying on the circle. 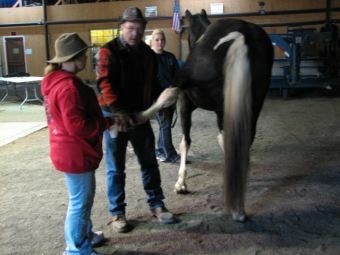 The key is to use the inside leg pressure with the dominant inside rein pulling toward the rider's inside hip. 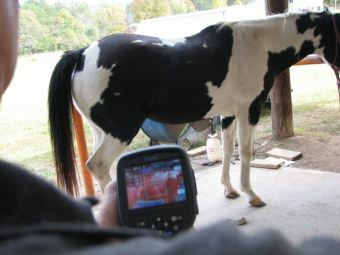 The goal is to get the horse flexible and obedient to the aids. Begin with step 2, and then push the haunches to the outside of the circle. The front legs travel on the circle, the back legs on a slightly larger circle. The key is to use the inside leg pressure behind the girth, with a dominant inside rein pulling toward the rider's inside hip. 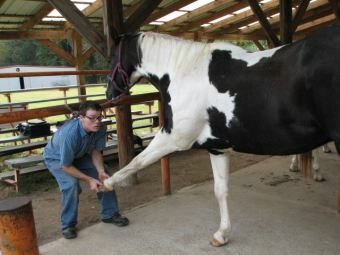 The goal is to encourage the horse to reach under more with his inside hind leg and move his legs laterally. 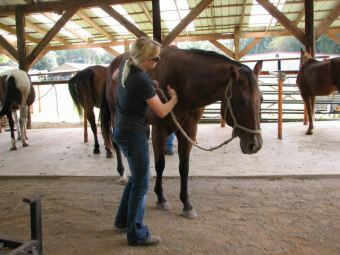 Begin with step 2, and then push the horse so he is leading with his outside shoulder into a larger circle. 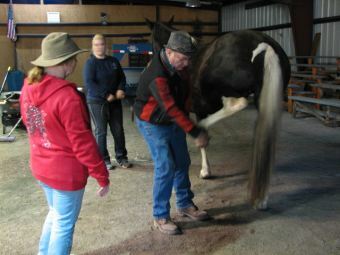 The key is to use the inside leg pressure while moving the inside rein to the rider's outside shoulder. 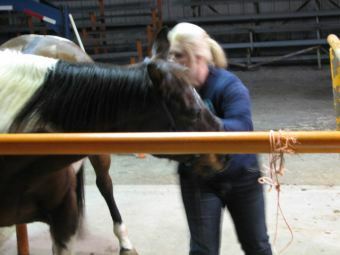 The goal is to keep the horse flexible and obedient to the aids. 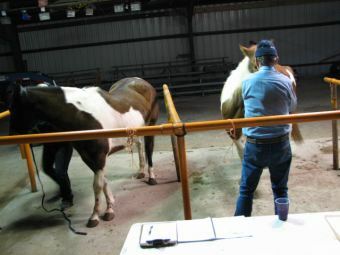 Begin with step 1, and then push the horse laterally out, evenly on the circle. 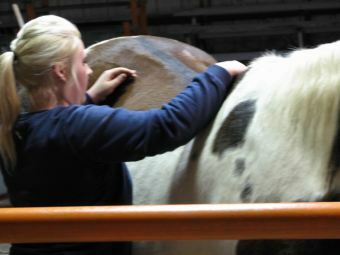 The key is to use the inside leg pressure with equal reins moving slightly to the inside. The goal is to collect the horse and make him obedient to aids. 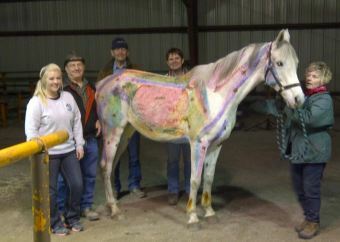 Begin with step 1, and then turn the horse so that the haunches remain in a small circle, yet the shoulders rotate around. 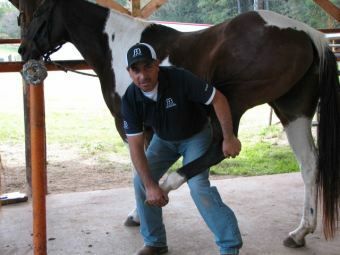 The key is to use the outside leg pressure behind the girth with a dominant outside rein. Keep the inside leg off the horse. 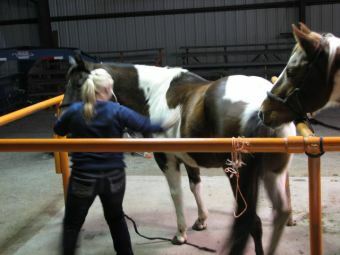 The goal is to make the horse obedient to aids. These exercises help build a solid foundation for the horse. They are also an excellent way for a new rider to learn how to control their horse and how much rein or leg pressure is needed for certain maneuvers. May 10, 2018 Ginger C.
Congratulations to Lynn Ezell, Jeff Bundick & GorJean Gibson! 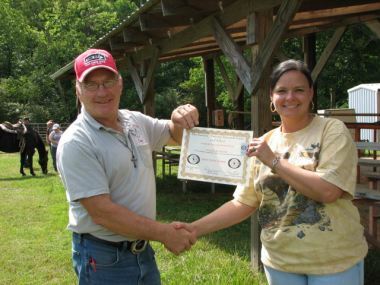 Click here to see all of our EFT Graduates! 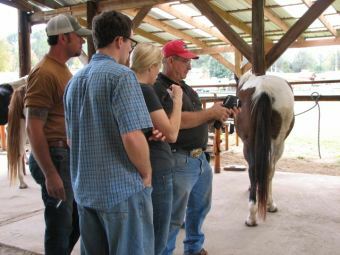 March 28, 2018 Ginger C.
Equine Flexion Therapy course March 22-25, 2018 with Dan Marcum, Instructor, at the FNRC in Georgia! 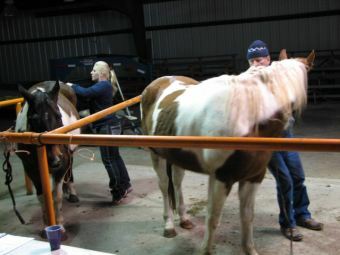 March 27, 2018 Ginger C.
These farrier students of the Casey & Son Horseshoeing School & Farrier National Research Center have completed their EFT Therapist Course! March 9, 2018 Ginger C.
Come Check Out our New Videos By Clicking HERE! 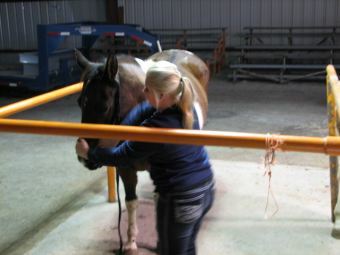 Openings Available for Equine Flexion Therapy Advanced & Beginner Courses! January 25, 2018 Ginger C.
Reserve your spot today !!! Click HERE for more info on what EFT is! November 15, 2017 Ginger C.
November 10, 2017 Ginger C.
Reserve an Equine Flexion Therapy For Your Horse!